Successfully Added 4 Channel NVR Kit - 4 x Waterproof IP Cameras, 720P Recording, 30 Meter Night Vision, IR Cut, Mobile Viewing Support to your Shopping Cart. This 4 camera NVR Kit represents awesome value for money if you're in the market for a comprehensive security system. for use in commercial or residential properties, this nifty little system just needs plugging into a monitor and you have a great little monitoring system. This complete DIY security kit includes one 4 channel NVR and four 720P wireless cameras. With HD video recording, 4TB SATA HDD support, and mobile phone support you can remotely monitor your property from any corner of the globe with the preview, storage, and playback options. Best of all this kit comes with 4 HD cameras that are protected from the elements by an IP67 rating, meaning they can withstand the worst of what the weather will throw at them. With HD resolutions they are perfect for covering outdoor spaces and with obstacles to interfere with their Wi-Fi signals you can enjoy greater freedom of where you install them. Each of the IP cameras has 36 IR LEDs and allow surveillance to continue well after the sun goes down. Thanks to night vision of up to 30 meters they can cover large areas such as parking lots, storage facilities or your garden. ensuring nothing goes undetected night or day. All the usual setups are easily accessible via the NVR, just hook it up to a monitor via the HDMI or VGA port and you'll discover the setup is a breeze. Don't worry if you're not on site as with mobile phone support this video surveillance system can be accessed direct from your phone, tablet or computer even if you're not on site. 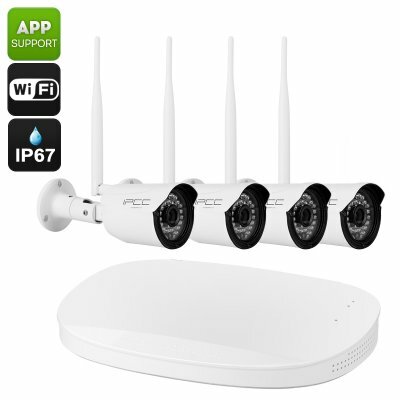 This 4 Channel NVR and IP Camera Set comes with a 12 months warranty, brought to you by the leader in electronic devices as well as wholesale surveillance kits and security gadgets..